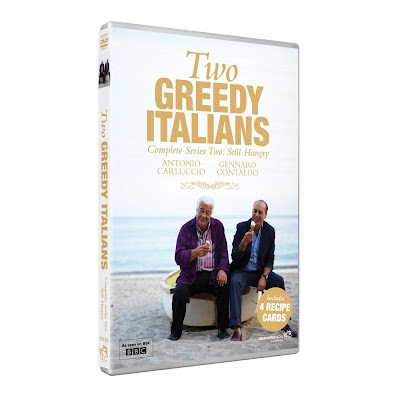 It's such a pleasure to watch Antiono Carluccio and Gennaro Contaldo in this second series of the BBC’s acclaimed food and travel documentary ‘Two Greedy Italians’ which is released on April 22nd by Fremantle Home Entertainment. Nowhere is food as much a part of everyday life as Italy, a country whose unique topography has resulted in distinct regional differences that are vibrantly alive and passionately celebrated. In this second series, the kings of Italian cuisine, Antonio Carluccio and Gennaro Contaldo, return to Italy to remember their pasts and discover how the culinary capital of the world is changing the way it cooks and eats. The relationship between the two chefs is affectionate but with a little bit of an edge, the documentary is beautifully shot and even without the cooking, you will enjoy the Italian scenery and the stories of the people they meet. In each of the four hour-long episodes, Antonio and Gennaro create dishes using recipes, ingredients and influences they discover along their journeys as well as some of their own favourite traditional meals. Throughout this series we explore both town and country, seeing how every Italian province has a unique culinary palette as inspired by its spectacular geography. • Calabria and Bambinone - a voyage of discovery. Antiono and Gennaro explore Italian childhood. If you are squeamish I would avoid this episode as it involves the killing of a pig and a pudding made from cocoa and blood. However, it has to be said that the Italian children tried and enjoyed the pudding. This episode also includes a risotto made with pearl barley, Suppa di Pesce and a delicious rich rice pudding cake with orange. • Liguria and La Bella Figura - Liguria is the Italian Riviera and Bella Figura is about making the best of yourself and what you have got, it's about pride and self-respect. In this episode Antonio has a taste of the high life and Gennaro steals figs and chestnuts from the roadside trees. We are treated to a foraged frittata and Genovese Fish and chips. • The Alps and Arrangiarsi - I think this was probably my favourite episode where Antionio and Gennaro live by their wits, hunting for mushrooms and stealing grapes from the roadside. We find out about Braesolo from Lombardy and Ricotta (which simply means re-cooked). I loved the chestnut mill designed by Leonardo da Vinci and the gnocchi that Gennaro makes with the chestnut flour. I received a copy of the Two Greedy Italians Series Two DVD, I was not paid for this review and all opinions are my own.